I was chatting with a friend yesterday and we normally try to encourage each other and be accountability buddies for our to-do lists. But we just weren't feeling inspired. I think the word "meh" was messaged back and forth a few times. Which is sort of funny because not being inspired led to the inspiration for this post. Just goes to show that inspiration can indeed strike at the most random times. But it got me thinking that there should be a list of reasons that you can give for not wanting to do something and people wouldn't be able to give you crap about it. Especially since the era of "no sleep - hustle - slay - multitask - ALL the things" seems to be winding down a bit and the era of self-care and mindfulness is taking over. 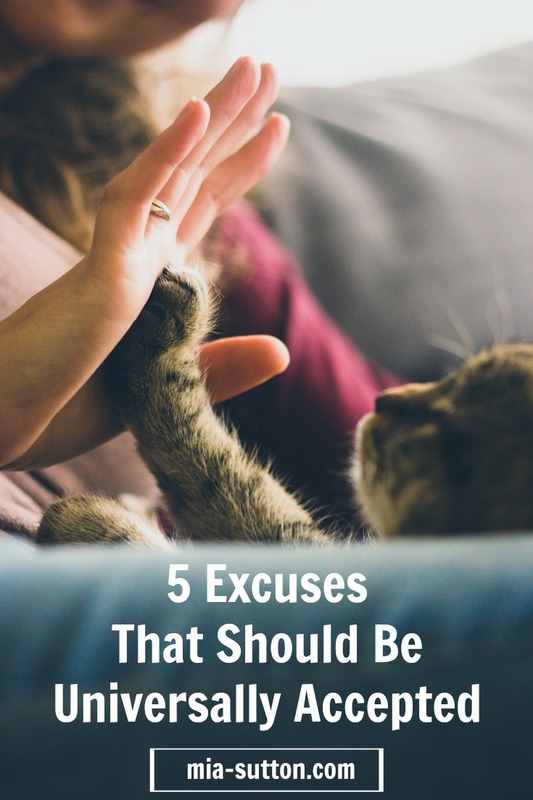 So, here is my list of 5 excuses that should be universally accepted - no questions asked. Look, ladies, you get it, right? There are a few days each month where we don't feel like ourselves. A certain amount of chocolate may be consumed. Sweatpants may be worn. If looks could kill, you'd be surrounded by dead bodies. Far be it from me to question you during these difficult times. Besides, I made a new friend. Feel free to follow along with me on Twitter. This is the kind of stuff you'll be delighted to see. 2) "I don't want to people." 3) "I'm growing a human." This is a longer-term, more complex variation on #1. Growing a human is exhausting work. It might look like we're just sitting, holding a watermelon and having a grand ol' relaxing time. But trust me. On the inside, we're building fingernails and earlobes, and are prone to hormonal rages. The proper response to this excuse: "Yes, of course, anything you say. You're right. And you're extremely beautiful." 4) "I haven't had coffee yet." I don't know what I ever did before I drank coffee. Because now I can't get anything done if I don't have it. It's best not to even look me in the eye until after I've been properly caffeinated and motivated. After 2 cups have been consumed, it is now safe to approach the bench. 5) "But Netflix is on." The be-all and end-all of the excuses. Let us binge in peace, please. There are 8 seasons to get through and no time to waste. Well, some time to waste, but you get the idea. Maybe try again tomorrow. Honorable mention: "It's Monday, though. Meh." So, there you have it. Someone should start a petition or something. I mean, not me, I won't have time between my coffee-drinking and Netflix-binging and providing excellent self-care to my uterus. Comment below and tell me what you would add to the list.